The following is a sampling of our most notable collections on this topic. Please refer to our online catalog, Discover.hsp.org , for more information about our books, images, journals, manuscripts, maps, and other items in our collection. You can also contact a Reference Librarian  for further assistance. The Society holds the largest assemblage of William Penn materials, many of which are in the Penn family papers  and Penn-Forbes papers . Other notable collections include the papers of the Logan , Cadwalader , Drinker , Jacobs , Lardner , and Norris  families. 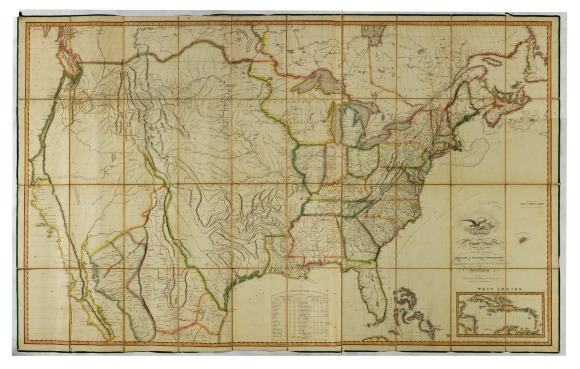 There are extensive early grants, deeds, and maps, a sampling of which have been digitized and are available on DigitalLibrary.hsp.org . The Kirk Brown collection of early Maryland and Pennsylvania surveys  and the papers of George Churchman , the Lightfoot family , Jacob and Isaac Taylor  include many early Pennsylvania land surveys. Researchers might also be interested in exploring various early records from Chester , Lancaster , Northampton , and Northumberland  counties for other early land surveys. The Mason-Dixon Line papers  and the Chew family papers  document the 18th-century project to survey the Pennsylvania-Maryland boundary. Notable collections documenting the creation of the American republic include the papers of Benjamin Franklin , Continental Congress President Henry Laurens , John Dickenson (in the R. R. Logan collection of John Dickenson papers ), Charles Thomson , and George Clymer . The writings of Eliza Farmer , William Strahan , John Warder , and James Allen  include extensive commentary on political events before, during, and after the American Revolution. The Society’s holdings include the first and second drafts of the U.S. Constitution (in the James Wilson papers ), as well as a 1765 Non-Importation Resolution  signed by Philadelphia citizens protesting British taxes and the only known original printer’s proof of the Declaration of Independence . On the military aspects of the Revolutionary War, see HSP's guide to Military Records, Military History and Wars . On politics in the early republic, see the guide to Politics and Government .